A perfect contrast of nature and technology, this grand pavilion is enveloped by thick forests which gives a natural background to this outdoor ampitheater, a reason why this pavilion is home to numerous musical events, art exhibits, and even charitable affairs. This pavilion is named after the wife of The Woodlands founder, George Mitchell. 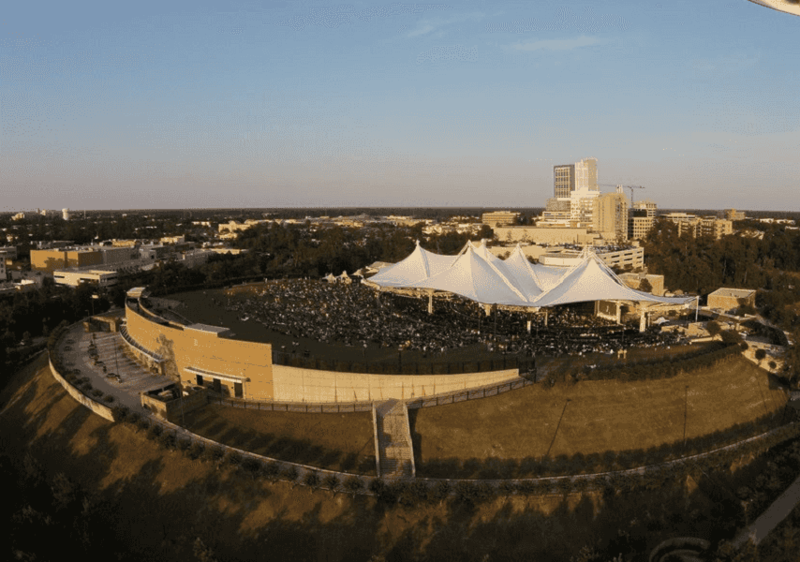 In 1992, the Mitchells graciously created an endowment fund for the Houston Symphony organization; thus making the Cynthia Woods Mitchell Pavilion one of its official venues for its summer concerts. Every summer, the Houston Symphony prepares themed concerts that will appeal to audiences from all ages. Some of this year’s themes are The Music of Led Zeppelin and Tchaikovsky. Check out their webpage to see their summer schedule. Every year, the Pavilion hosts the famous Children’s Festival supported by ExxonMobil. This annual activity aims to provide a venue for children to showcase their artistic talents, at the same time, to entertain children through art and play activities. Some of the featured activities are the Arts Alley, where kids can explore their artistic side, the Healthy Kidzone, where kids can learn more about how to take care of their bodies, and the Activity Tent, where kids can enjoy some rides and games. The Children’s Festival is scheduled to take place on November 14 and 15 this year. Make sure to bring your kids along and have a bonding activity with them. As this Pavilion was established from the generosity of its founders, a lot of charitable and educational activities are held at the Cynthia Woods Mitchell Pavilion to stay true to its vision. This is a musical program that gives opportunities to 4th Graders from Conroe Independent School District to showcase their musical talents. These 4th Graders are given a chance to try instruments that are played in orchestras with the hopes that these students will pursue music by the time they enter 5th Grade. Watch this inspiring concert take place at The Woodlands Pavilion. Similar to an Open Mic Night, the Young Talents Spotlight gives opportunities to young, local talents to show what they can offer on stage as a front act performance. The Young Talents Spotlight is usually held at the Side Stage or the Main Stage of the Pavilion. You and your friends can have a go and earn your few minutes of fame here at the Pavilion. Being at The Woodlands can truly be an inspiring and rewarding event in your life. Take part of the advocacies of the Cynthia Woods Mitchell Pavilion and be able to change the lives of the youth. All of these can be easier to do when you leave your transportation needs to C&S Executive Transportation. You and your friends can attend a concert or can support a cause; whatever it is our company is here to bring you to your destination.